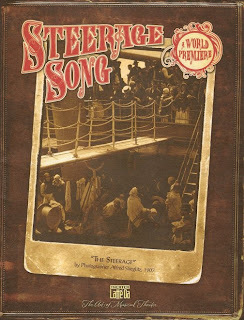 Steerage Song is a new concert/theater piece created by Theater Latte Da's Artistic Director Peter Rothstein and local pianist/accordionist extraordinaire Dan Chouinard. I'm familiar with Peter through his work with Latte Da and many other theaters in town, and I was introduced to Dan by the late, great MPR Morning Show (the spirit of which lives on in MPR's Radio Heartland). When I heard those two names attached to this piece, I knew it would be good, and I wasn't wrong. 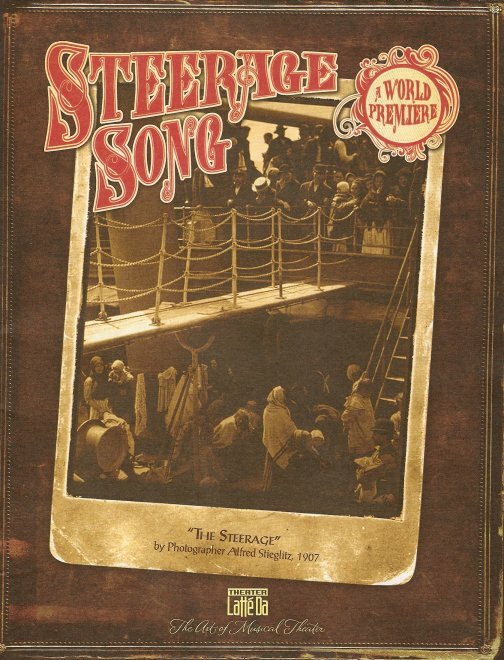 Steerage Song is about the immigrant experience, focusing on immigration from Europe between 1840 and 1924 (when laws were passed significantly limiting immigration to this country). The structure of the piece is similar to Latte Da's annual Christmas show All is Calm about the WWI Christmas Truce: a series of songs about the experience connected by historical text describing the events as well as the feelings of those involved. Dan and Peter have collected over 40 songs relating to the immigrant experience. The songs come from 20 countries and are sung in 18 languages. They're arranged into six parts, covering the decision to leave home, through arrival in Ellis Island, to making a new life in the Lower East Side (next time you visit NYC, make sure to visit Ellis Island as well as the Tenement Museum to see how immigrants lived 100+ years ago). The first half of the show features mostly mournful songs of leaving (I was particularly moved by the Irish "Emigrant's Letter"). As Dan said in the post-show discussion, it's slim pickings trying to find happy songs about leaving your home forever. ;) The second half of the show focuses on one of the most famous musician immigrants of this time - songwriter Irving Berlin (aka Israel Beilin from Russia). In addition to assembling interesting, funny, touching songs, Dan and Peter have also assembled a talented group of singers and musicians. 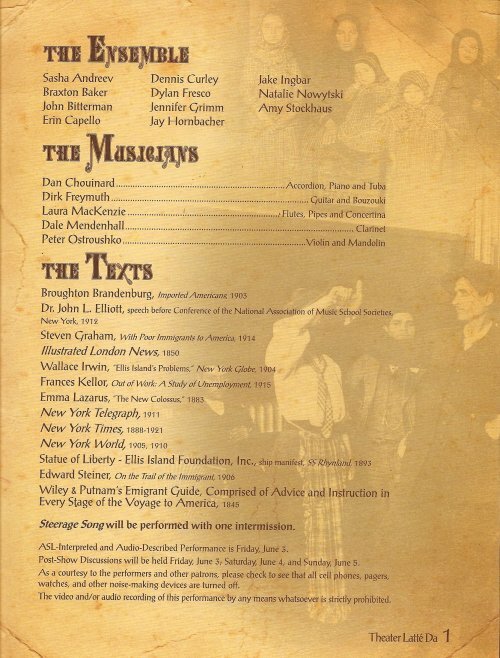 The 11 singer/actors include several who have appeared on this blog before: Sasha Andreev, Erin Capello, Dennis Curley, and Natalie Nowytski (click on the tags at the bottom of this post to find out where). All of the singer/actors were wonderful in their own way, singing and speaking in accented English or foreign languages. I was particularly impressed by the two young boys Braxton Baker and Jake Ingbar, who held their own with all the "professionals." The four talented musicians were led by Dan Chouinard (on piano, accordion, and tuba!) and included the great fiddle/mandolin player and composer Peter Ostroushko (another frequent guest on the Morning Show). All of this adds up to a wonderful evening of music! 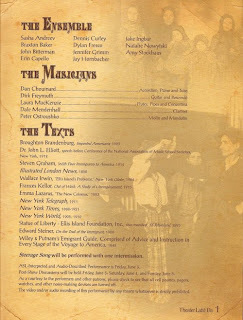 As a collector of playbills/programs (you may have noticed that every post on this blog includes a scan of the playbill), I have to note that the program for Steerage Song is itself is a work of art. It looks like an old photo album. The text is printed in old fashioned font against a background of sepia-toned photographs of immigrants. It's really quite beautiful. The show also featured projections of these photographs onto the brick wall at the back of the stage at the Fitz, as well as text describing the songs being sung or quotes being spoken. Even though this is a period piece, the themes are quite relevant today. The struggles facing immigrants and the reaction of those observing and legislating immigration are similar to what they were 150 years ago. Perhaps remembering our own immigrant history (except for those of Native American descent, all Americans are descended from immigrants) will inspire us to be a have a little more compassion for those immigrating today.